See the dragon’s large mouth? The Dragons are back!The Dragons are back! I have been seeing them everywhere. Just take a look at some photos that I’ve taken in Kentucky, North Carolina and Scotland. They have also been showing up in people’s dreams and in the clouds. 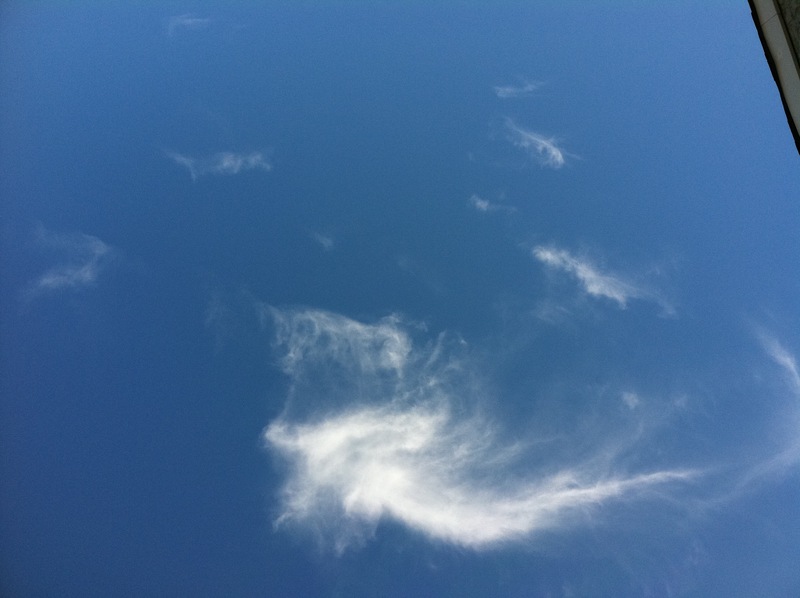 Please note that these pictures are taken in a sky that is clear and blue and completely devoid of clouds with the exception of the “dragon” cloud itself. It is my understanding that the elementals of the air, the sylphs, are copying what they are observing. I honestly have hesitated bringing you this information because it seems so surreal. 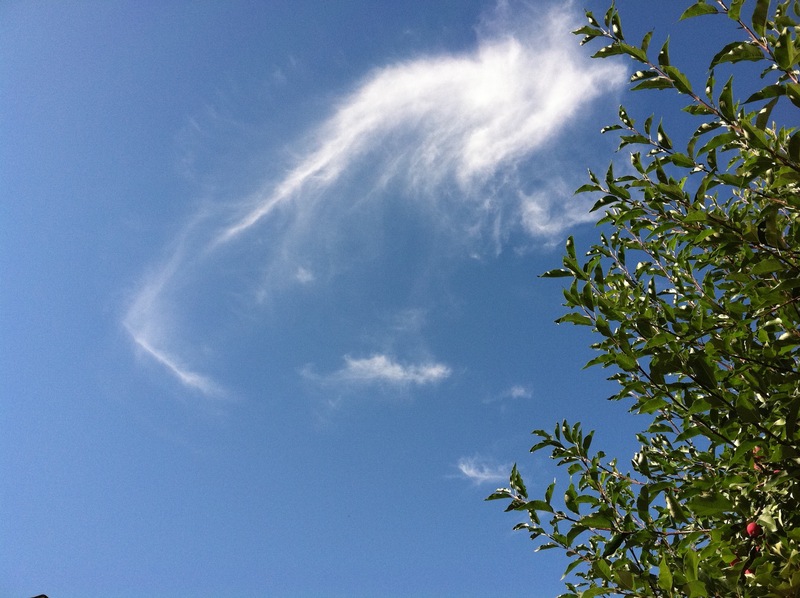 Yet in a perfectly blue sky with NO signs of any clouds, a dragon appears while I’m teaching outside in nature. This dragon spectacle cannot be ignored. Especially since this has happened three weeks in a row and in three completely different places. There are two traditions of dragons: Eastern and European. The European dragons were chased into oblivion by the religious persecutions of an earlier time. St. Patrick was famous for having “driven the dragons out of Ireland.” The Eastern tradition revered dragons and held them as a source of profound wisdom. It is worthy of note that January 23, 2012 marks the beginning of the year of the water dragon. Following the word meanings, we find that in both East and West dragon comes from the root word “to see clearly.” The message becomes obvious. So the dragons are back to help us see clearly! They have returned to boost our clarity. You don’t need dragons to do this for you, of course, if you have an activated MerKaBa and a solid Higher Self connection. You can add the dragons to your collection of tools to help you navigate the very busy world in front of you. You can ask your dragons to search out and bring to you helpers or resources to assist your project. Even more importantly, the dragons can help you recognize the truth as it is spoken to you. Dragons help you with directions, with seeing where you want to go and helping you with your own sense of direction – both literally and metaphorically. They will help you see a situation clearly too. They are back because the need for human discernment is greater than ever. How do you call in your dragons? Ask for your dragons to come forth and watch for the signs that they are there. They love to be called and will show up for you, in your dreams, in the clouds or elsewhere. Take the time to get to know your dragons and their names. Get quiet and ask for your dragons to be present and then ask for their names. Use what pops into your head immediately. From that point forward call your dragons by name. You can have more than one dragon and they can be of either gender. Once you have a dragon’s name you may summon it and give it requests. It has adopted you as its human and is attracted to you for your specific purposes. Never give the names of your dragons to anyone unless you totally trust that person to respect and honor the names. Having your dragons’ names is almost the same as ownership of them. I saw a Dragon cloud after a nap and asked its name. Now i have a Dragon. Afterward on the same day i received clarity about something i needed. wow!